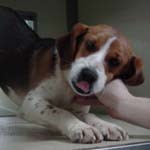 Pax is a nine month old Beagle boy, really quiet for a beagle and fully crate trained. He is just a sweet, sweet pup and much cuter than the picture. He weighs about 15 lbs and he's a bit cross-eyed. It makes him all the more endearing. He's just a wonderfully affectionate pup. 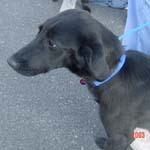 Gracie is 18 months old and was saved from a shelter in the south. She is a lovely dog. Good with kids. Misty came to us as a stray, and we located her people, but they were not able to take her back. 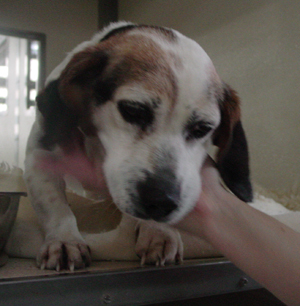 It's a sad story, but Misty won't let it get her down! 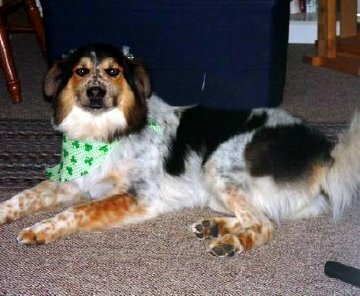 She is a Collie mix, but very short. She is so pretty with her unique coloring. She is just so very sweet and charming. She is an affectionate girl who wants to be by your side. She tolerates other dogs but doesn't like dogs who jump into her face as she was tied out and picked on by male dogs. This pretty girl is Lila. 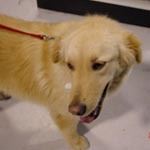 She is a Labrador Retriever mix. The shelter said she was 6 months old (as of 3/23), but she looks and acts a little older. Nevertheless, she is a puppy with puppy playfulness and more than enough calm to make her a very sought-after lab (most have high energy). She is good with other dogs. 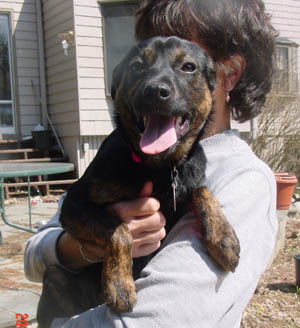 Desiree came to us from a shelter in OH. 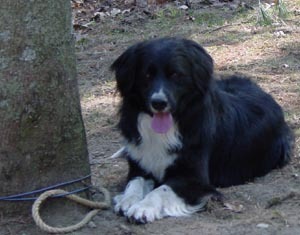 She is a gorgeous dog and very affectionate. She's going to bond well as she rode part of the way to MA with her head on the driver's lap. 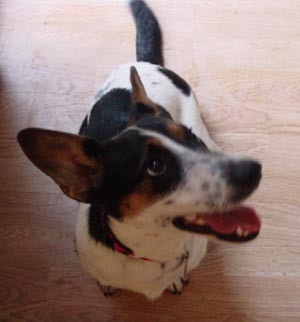 She's great with her dog walker as well and is personable to everyone she greets. She has a lot of personality that seems to keep coming out the more we know her. 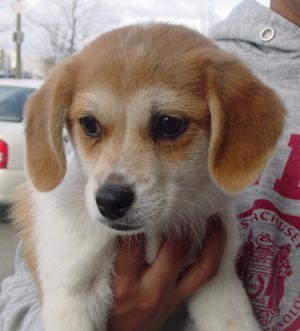 Transferred to Baypath Humane Society in Hopkinton, MA and has been adopted. 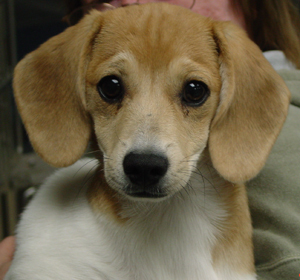 Rosa is a 3 month old beagle mix pup. A little girl, but a real hell-raiser when it comes to play. Who could resist that face, though? She and Rosa are full of fun and play, play, play. Five year old beagle girl. Very Sweet. Princess is a 3 month old female Shepherd pup. She is just a love and a really good puppy.Crate trained.Her picture doesn't do her justice. She has a gorgeous coat and very pretty face. She is as sweet as can be and very smart like a shepherd, but has all the qualities of a mixed breed dog. She is a cuddly dog and loves to be held and stroked. She's doing to be small to medium-sized. Adoption in progress. 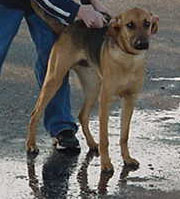 Dallas is an 8 month old German Shepherd mix who is mostly shepherd. He is totally house broken and mild mannered. He weighs about 45-50 lbs. His foster mom says he is a velcro cuddler. He is fostered with a female shepherd and they play all day. What a cutie! He is a total sweetheart. 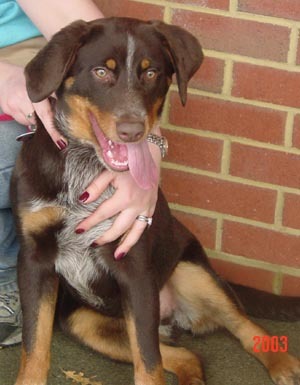 Bear is a Labrador Retriever,Catahoula Leopard Dog Mix. He is a puppy.This adorable face belongs to Bear. 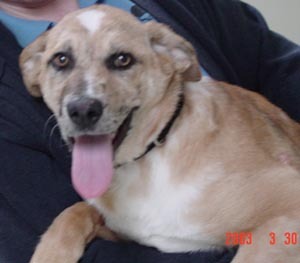 He is a 3 1/2 month old (as of 3/1) Labrador Retriever/Catahoula Leopard mix. He is as huggable as a teddy bear! 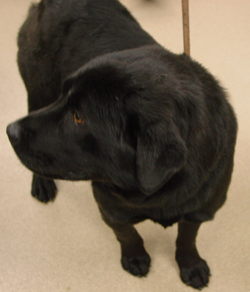 Bear is an active, playful dog who loves to romp and run. He enjoys other dogs and will be a fine in a mult-dog home. He is a happy, friendly puppy who knows no strangers. He thinks all people are here to pet him. And with his face, most everyone wants to stop and pet him! He is also smart and will train very well. 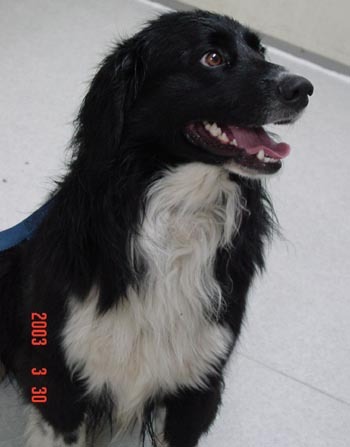 We are boarding him in Sudbury and if you have an application on file, we'll meet you at the kennel to show him. 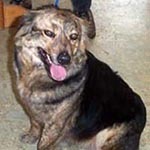 Maggie is young female spayed mixed breed who whose owner worked long hours and felt she deserved a better life. 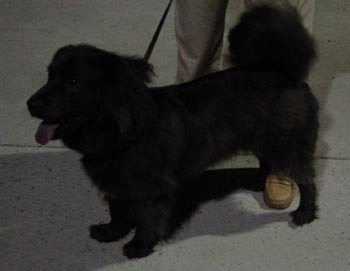 She was listed as a Peke/Pom mix, but we don't see either breed in her. She looks more like a spaniel/lhasa mix. 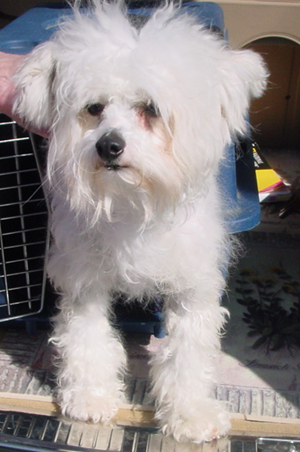 She is spayed and crate trained. Notes: This cute little girl is only a year old and is crate trained.She just loves to ride in the car and will kiss you all the way to where you're going. 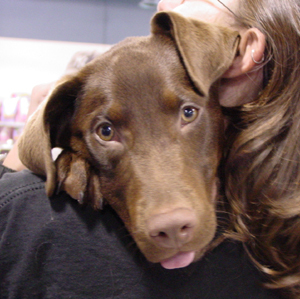 Cassie is a gorgeous chocolate lab mix with a little white on her chest. She's medium sized, 45-50 lbs. and a bit shy at first, but is as sweet as can be. Available upon spaying. 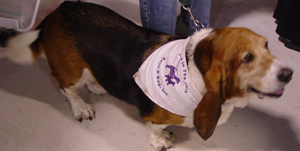 Brandy is a 5-year old pure-bred spayed female bassett hound. 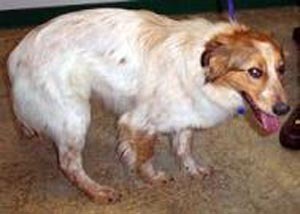 Raised from a puppy by an elderly man, who could no longer care for her due to failing health. She is fully housetrained. She is an excellent walking companion for leisurely morning and evening walks on leash. 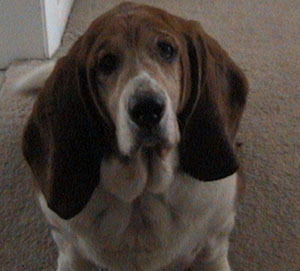 Like many bassetts, she has some skin allergies and will need frequent baths or professional grooming. Diet should help with this too. 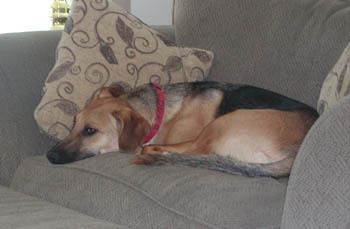 Brandy is a true couch potato and would be perfect for a retiree or someone who is home a lot. She was not raised with children, so we will not be placing her with kids. Brandy is doing well in her foster home with a resident beagle. They do not play, but they seem to get along well. Looking for a nice home to enjoy quiet, leisurely nature walks on leash, the occasional treat and a back scratch. Adopted. Butterscotch is a five month old Catle dog cross. She will be medium sized and is a bundle of love and energy. Her tail never stops wagging. She will need some training not to jump up but she's small enough so that it's not a big deal right now. She's about 25 lbs. and will grow to be in the 40 lb. range. She loves people and gets along great with other dogs. Adopted. This 4 month old puppy arrives on 4/6 along with 3 adult labs. She is a sweet, sweet puppy. Adopted. 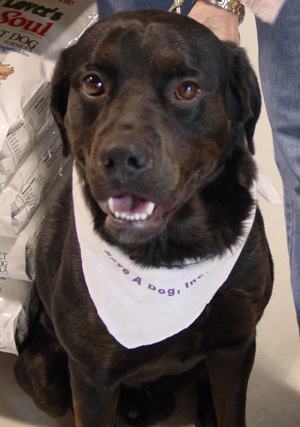 Dexter is a gorgeous labby boy who might have a little Rottie thrown in. He is an absolute MUSH of a dog who loves to ride in the front seat of the car with his head out the window or in your lap. Already neutered and begging for a home! He came from OH and all the transport people raved about him. He didn't like the crate, but if you let him sit on the seat he's your best friend. Good traveling buddy for someone and very well behaved. Had to have been someone's pet as he knows many commands. Adopted. Boomer is a very happy boy. He is house broken and was with a family who had to give him up because of a new land lord. He was raised with kids, but we recommend strong kids or teens as he is strong and has lots of energy. He is ready to find a playmate and get a new home. 60 lbs.. 2 yrs. old. 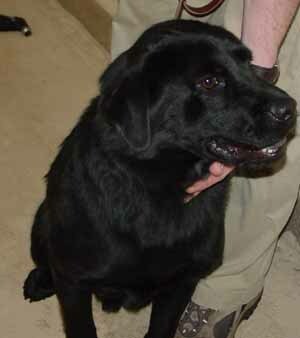 He was one of West Virginia's death row dogs. He is high energy and has no training, so please be willing to work with him and have a place for him to run. He is in foster care and he plays well with the resident lab. 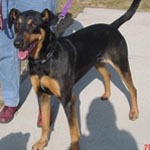 Good with cats, plays hard with other dogs, so labs or large breeds are best. Would be great with a female lab who likes to play. Needs a fenced in yard or a rural setting where he can run. Adopted! Monty sitting by a tree. He initially was tied as the foster's fence is low, but he is not a jumper and likes to stick around, so he uses the doggy door to come and go and stays within 10 feet of the back door as a rule. This day he was under the tree because the foster folks were working in the back yard. He is good with the foster dogs and knows his place in the pack (not at the top). Plan on love at first sight when you meet Tripper. Tripper is an adorable 15 lb. 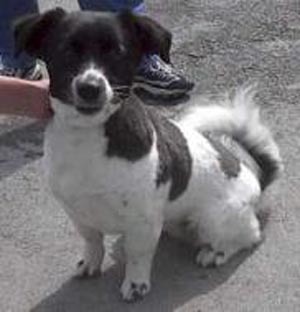 female houndy Jack Russell cross. She has one ear up and one down. The picture of cuteness and adorability. She could be mixed with basset or beagle as she has the shark's fin tail that they are famous for. Her personality is very sweet, curious, affectionate and just darling. She doesn't have a serious bone in her body and just loves everybody. She is all play like any pup, and then she will crash, big time. She is as smart as a whip too and figured out the doggy door the first hour in the foster home. She has energy, but it's not with the intensity that you see in most JRTs. She is just a love.She's spayed, all vaccinations, and ready for a permanent home. .